The Benedictine Prioresses from all over USA, Canada, Puerto Rico, The Bahamas and Mexico meet every year for their conferences in different locations. Two years ago, Immaculata Monastery hosted the conference. This year we were with the Benedictine Sisters of Mount St. Scholastica in Atchison, Kansas. The 48 prioresses started their conference on January 31st with a Focus Conversation on the future of the Benedictine monasticism. It was facilitated by Sr. Kerry O’Reilly from St. Benedict Monastery in Minnesota. We had intense and fruitful discussion, listened to four Benedictine women under the age of 55 on how they see their future and what the next step will look like. On February 1st, we had our business meeting and then each federation met. February 2nd, the feast of the Presentation of our Lord, was reserved for outings. Twenty of us visited Conception Abbey, Missouri. After some explanation and tour of the renovated Basilica we visited the Benedictine Sisters of the Perpetual Adoration in Clyde, Missouri. 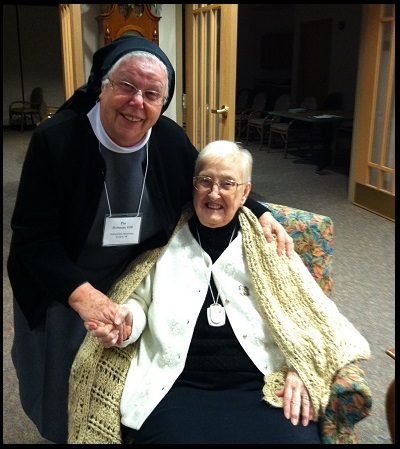 Here I visited a dear old friend of mine, Sr. Paula Thompson, OSB I met 20 years ago at the Novice and Directress Institute in Ferdinand, Indiana. We kept connected all the years and now she is in the assisted living of the monastery. It was very nice to see her again. The next two days were days of recollection with some input from Sr. Irene Nowell, on “Women of Hope: Old Testament Women Speaking to Us Today.” This CBP meeting is the best of all the meetings where we share with other prioresses the concerns and struggle each has to experience in her community. It is a real blessing to meet all these wonderful Benedictines.